Downtown gem Efendy Turkish and Mediterranean Grill has it all—fresh food, affordable prices, unforgettable flavours and impeccable service. Efendy quietly opened on Dresden Row late in 2013. Its dining room will feel familiar to anyone who spent time in the late, great Fid. The banquette is still tucked into one of the walls, while the other is a bold red with a chalkboard menu and a little shelf where a single bottle of wine sits. The kitchen, however, is vastly different. A counter and wall have been removed, exposing a big, bright kitchen with a charcoal grill at the front, making it both a stage and a warm fixture where the chef, Ali Simsek, brings vivid scents and sizzles farther into your experience. On our server's recommendation, my friend and I split the six-course set menu ($27)--- made up of a mixed mezze plate, a salad, a mix kebab platter, dessert, and coffee---and, also on his recommendation, two hot starters, halloumi ($6) and calamari ($6). We each start with a Turkish coffee ($2). 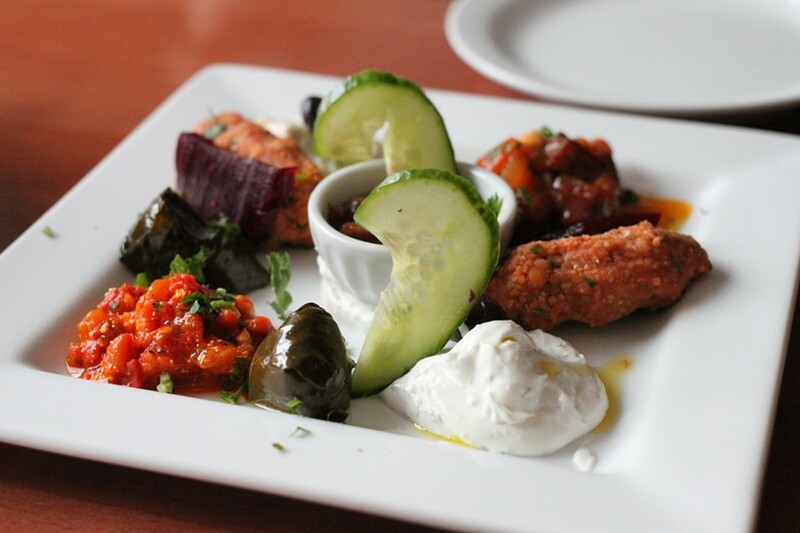 The mezze plate features tasting portions of a number of the dips, along with lentil kofte, stuffed grape leaves and a few refreshing bites of beet and cucumber. The dips are all fantastic. The red pepper dip is bold and salty with feta. A creamy dollop of baba ghanoush is mildly nutty, garlicky and silky with eggplant. The cold eggplant saute in a sweet tomato sauce is, perhaps, my favourite dip on the plate---I could eat a gallon of it. The haydari is another favourite: a tart, mint-and-dill-spiked yogurt dip. Outside of the dips, we each have a bite-sized grape leaf---a slightly bitter wrap with a tender rice filling---and a lentil kofte. The kofte is great: the bulgur and lentil patties are nicely formed, flavoured with delicious red pepper paste. They are extra delicious with the restaurant's own spicy chili sauce. It must be said how wonderful the chili sauce is. It's akin to a salsa, a tomato puree with hints of garlic, herbs, peppers and lemon; it has just the right amount of subtle heat and tart sweetness to make it completely addictive. We make sure we have some on-hand for the rest of the meal, not a hard feat since the service at Efendy is impeccable. Our water glasses are never empty. Our server is incredibly attentive. The slightly salty semi-soft halloumi cheese is next, delivered in thick slices with blackened stripes from the grill, set atop an acidic salad. The cheese is warm and mild, perfectly touched with the deliciously dusky taste of charcoal. It is even better with the chili sauce. The calamari also benefits from that sauce, but works best with the creamy haydari it's served with. The squid is hot and perfectly supple. The batter is on par with the best I've had, light and flaky with a perfect amount of salt. Our server told us it was great when he suggested it; this is a rare dish that truly exceeds my expectation. The low point is the salad course. Mostly comprised of tomato and cucumber, it's been too long in the fridge, the vegetables have a chilly, watery texture. But it's quickly forgotten when the kebab plate arrives. 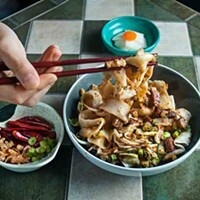 A huge pile of tender, juicy meat sits next to a pile of fluffy rice pilaf and little bowls of chili sauce and haydari. Cubes and koftas of local lamb and chicken have the lash marks from the hot grill that add an ashy flavour to the fresh, bright seasoning of the koftas. Charred onion and green pepper add a little more sweetness and bitterness to each bite. It is all really, really good. Efendy is still quietly sitting on Dresden Row, and that's a shame. A restaurant this good---and this affordable---should be busy all the time.